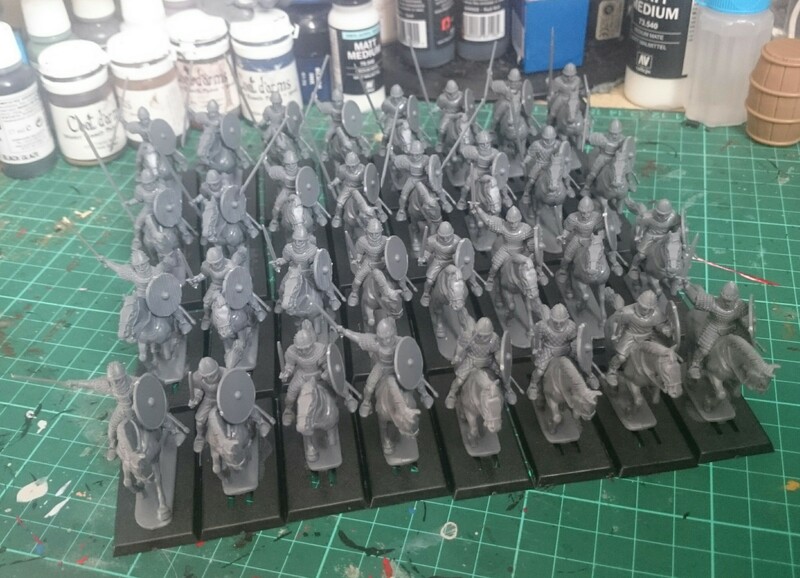 After an abortive attempt to finally start painting my 6mm French, I settled instead on putting together a host of plastic Norman Knights from Conquest Games. These are to add to my existing Norman force, but these are put together with round shields rather than kite shields to easily differentiate them on the field, as these are meant to be mounted Warriors rather than Hearthguard: 4 units in total (32 models). The figures go together pretty well, although attaching the shield can be a little awkward…and I’ve already been taken to task by several people on social media for gluing the riders in place before painting the horses…I will probably regret it, but too late now. The cavalry are now primed and ready to go. I used Vallejo Surface Primer (Black) for the first time, and I’ve been pretty impressed with it’s coverage and finish on these models – and at £11.99 for a whopping 200ml, it’s great value when compared to smaller bottles of brush-on primer. I use brush-on primer as I don’t have an indoor area where I can use a spray can, and I like to keep my painting process consistent – using brush-on allows me to prime models at any time, in any weather. Hi Neil, how flat is the black primer? I can’t tell from the photo. I still use humbrol enamel matt black. I don’t spray as I find it misses so much that I end up re undercoating with a brush anyway!